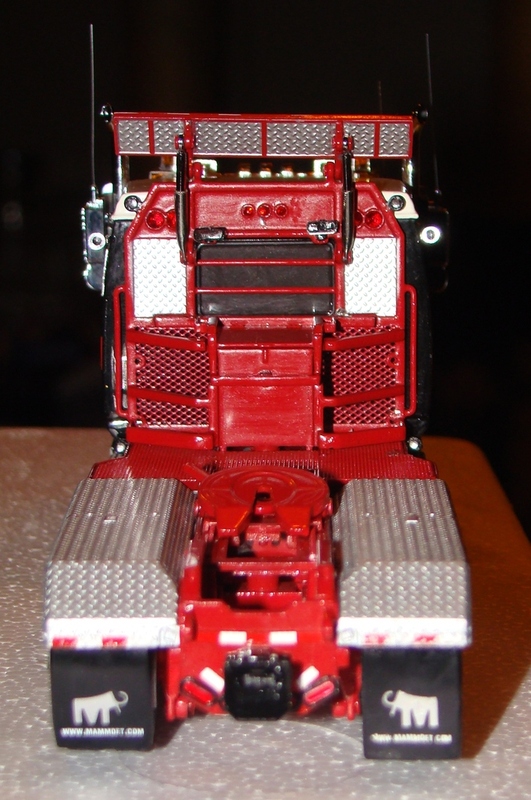 i don't want to make to much details in it,and also extra work,just a simple truckmodel. I can understand you feeling like that, Thijs. But I have followed you for a long time through all the very careful work you've been doing (and learning a great deal about trucks in the meantime) and watched how careful you are to get the smallest detail correct, so it would be good to get this Kasteel Meeuwen one as perfect as possible. 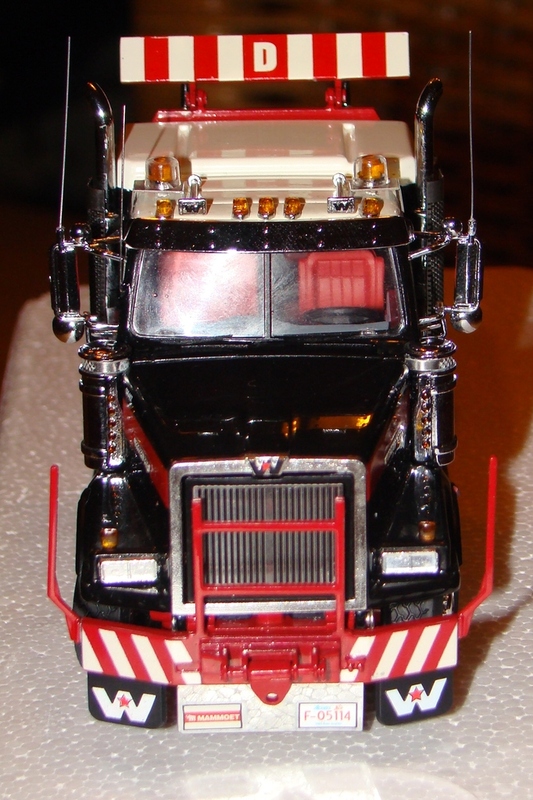 Even more so because you have found a single axle truck of theirs and you've at last got the right shade of paint. You could also find something for the lifting eyes that Clipper mentioned, couldn't you? Another little detail correct! You could also find something for the lifting eyes that Clipper mentioned, couldn't you? Ivy, I think we have founded a pressure group to influence Thijs' model building. Now all we need is a name. How about "Popular Front for Kasteel Meeuwen Lifting Eyes", the PFKMLE. yeah yeah,just pressuring me,but one the Original slurry tank ,there are no lifting eyes.hahahahahahahahahhaah. 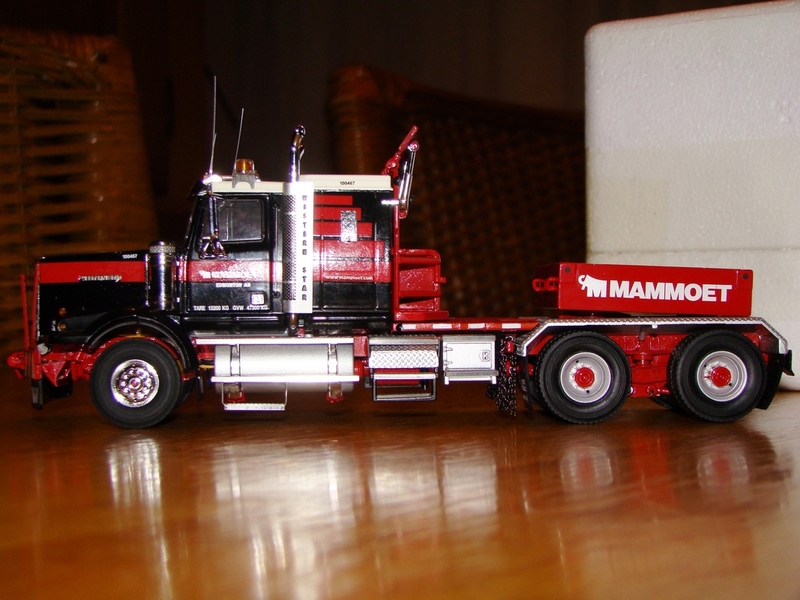 was yesterday to the tekno museum,a bought me a lot of junk,today to the wsi museum another truckmodelbuilder,lets see what they have. Clipper, I've been a one-woman pressure group since I was first over there a few years ago and standing in front of one of his cabinets of models. Why do you think he's been working so hard? Without me he'd be slacking all the time. (MInd you, it's hard work being a pressure group with someone like Dutchie! See how he's wriggling to get out of the lifting eyes.) What about PFFPT - Popular Front For Pushing Thijs? Ah but you found that single axle truck of theirs and that did have lifting eyes. That's the one you are doing now in #310 Hahahahahahahahahahahahahahahaha. BAH, stop wriggling. More later? How much later??? Expert use of multi-quoting in that last post! Oh, I'm glad you made that comment for I was just going to Post to you somewhere as to how I followed your instructions to the letter and hey presto! Now I can answer here. Mark, how you ever found that out I just don't know, but wanting to do it here instead of my usual copy/paste I determined to look back at your instructions, have copied them into my How-To book of words and will use it from now on. You really do deserve yet another putty medal - hope the chest is big enough. 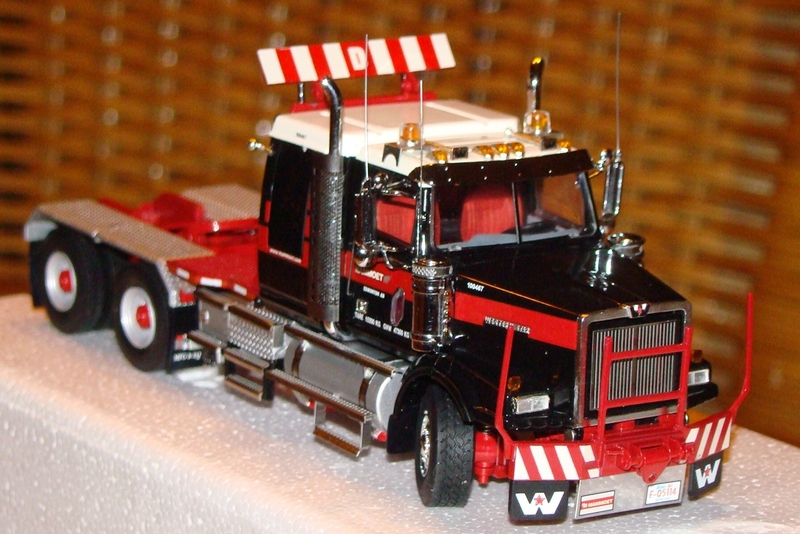 i could making those lifting eyes,but the model won't be the same as on the image with the single axle truck. for the simple reason,that slurry tank issn't the model of tank i have,so made a model of a truck ,which normaly don't drive like that. but i had a Renault Magnum model ,and i bought me years ago a slurry tank trailer,there is a company nearby which drive Renault and transporting manure,so 1 and 1 is 2.
today at the other model brand have made the same slurry trailer,much more detail (with out the lifting eyes) but not as a kit,so i should have break it apart,with out breaking parts. but i couldend found good images of that slurry tank of the topside,so ypu can see that there are no lifting eyes. yesterday we went to the tekno museum for the ''oliebollenweek'' (a kind of bagel,but then as a bal) looking for parts ,or a B-model or a good model. we as builders call it the ''rummaging???? 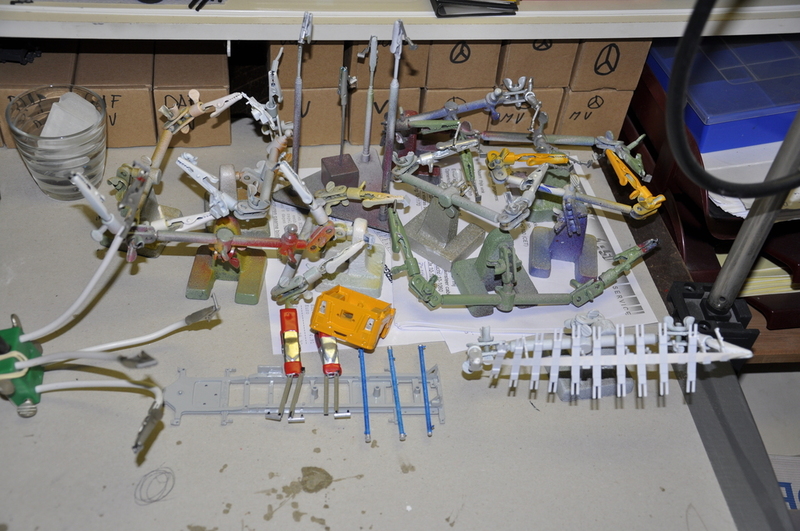 days'',part bins full with left overs from production of models. this was booty,and payed 25,00 euro's for it. laying it out over the table to sort it out,under the watching eyes of Kelly. you see Ivy,not much later,darn i'm good. 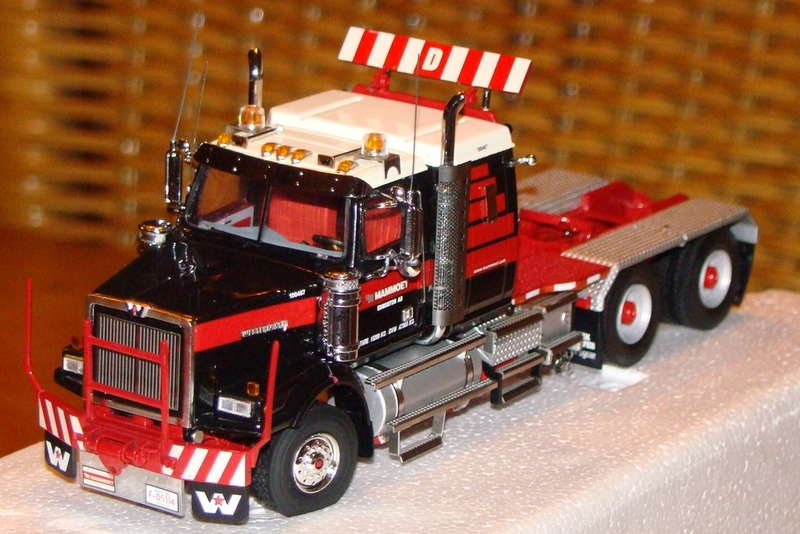 boughtme this one at the shop of WSI,the other truckmodelbrand. 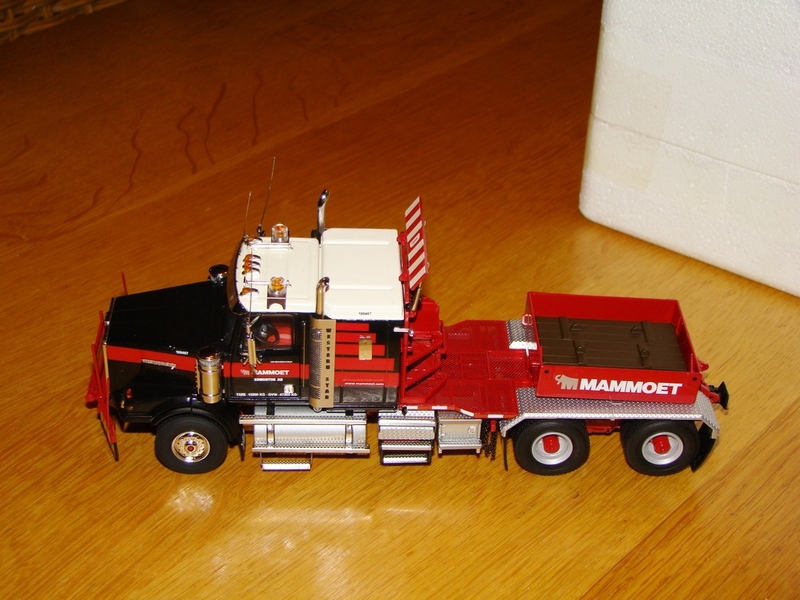 a model of a ''western star'' of heavy transport company mammoet,the american part. 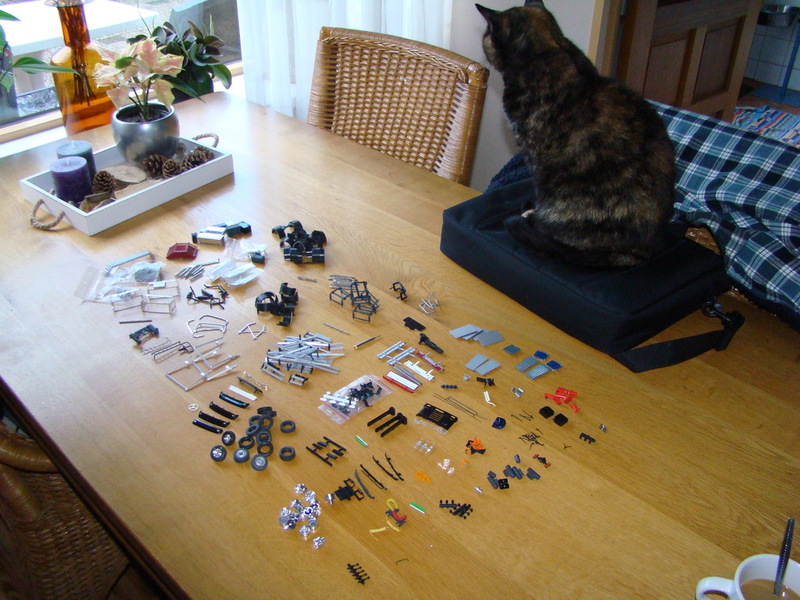 Yes, but anyone can go out and buy some bits and pieces and set them out nicely on the table. You'll just stuff them in a box and forget all about them. It's seeing them being used that I'm waiting for. What vintage is that Western Star? Oliebollen are great - nothing like bagels. Scrumptious. i was revering to what i should bring home from the museumshops. 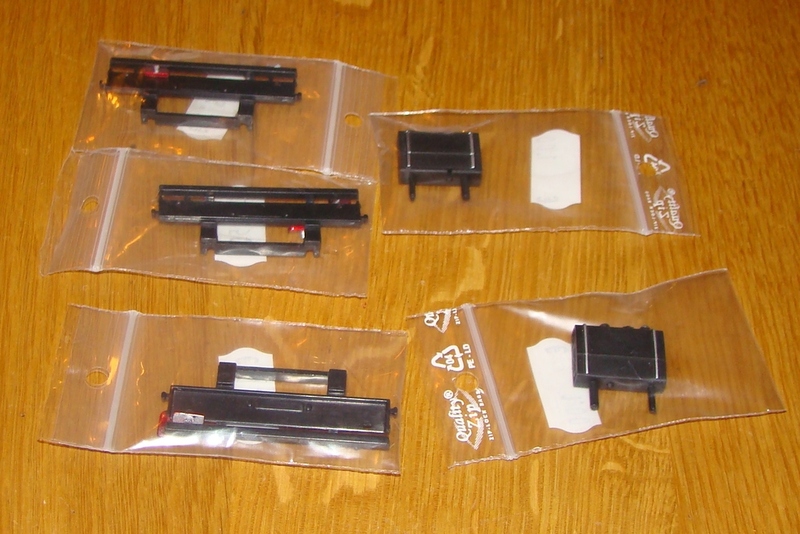 i also take there 3 trailer bumpers and 2 hydrolick tanks. 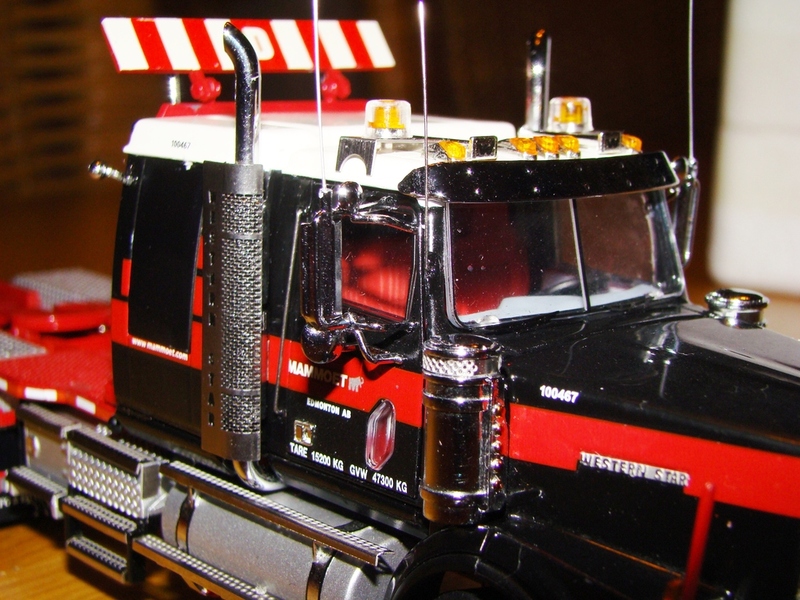 a nowadays model,look at this link https://www.google.nl/search?q=weste...tm%3B800%3B586 and see those trucks,even the one that stood model for it. Wow, Thijs, they look fine. But I thought vertical exhausts were a thing of the past. (That shows how little I know, ). I'd love to see you make some models like those. Would the parts be difficult to get? Bagels are boiled, whereas oliebollen are deep fried. They're like our doughnuts, except that doughnuts are usually rings. Must look for some oliebollen in May. Wa-hey. in europe vertical exhaust is from the past,because you may not change something in the exhaust system because the invoirement rules. the usa however had Always the vertical exhayst system had,agains our horisotal system. probally for the mainreason, the lenght of the truck. yes donuts- doughnuts,is was wrong with those. but anyway those things that made the American cops THE American cops. atleast that is what they tell us in the movies. but dow,instead of dough was wrong aswel. A 1:50 scale bagel would make a great lifting eye. no i don't think so Clipper,to smal and to round. painted today a lot of smal things,parts for the bike drive under protection in a silverlook color,sprayed some parts aswel for that ,and some slurrytank parts in the white primer. the lower cab part of the Renault was already sprayed yellow and with the varnish ,so painted the headlight reflecters chrome silver. also sprayed the 3 slurry hooses in white primer and painted them clearbleu for the first time,but will come more lay(ers) over it. 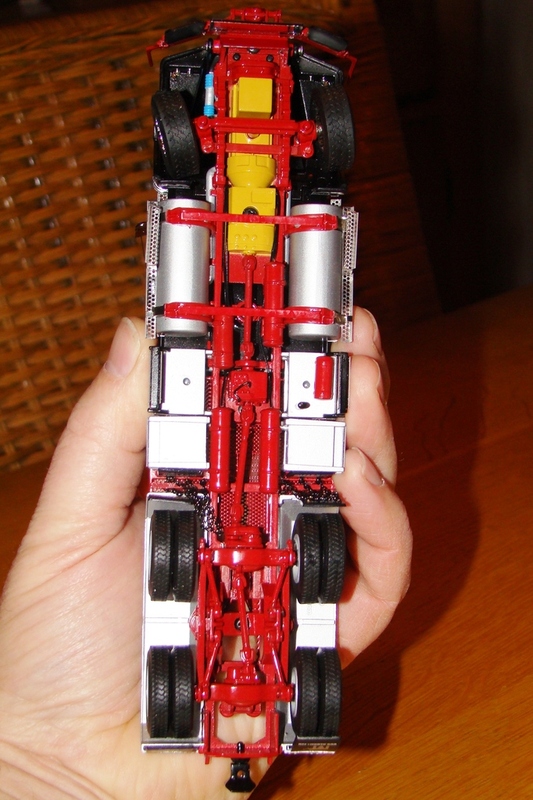 the parts are so smal that you can hardly se them,but every ''crocodilemouth) has a little part clamped. now the decalmaker is working again for me,maybe it's better that i do some work at those models too,before they arrive. taped the bumper parts of the chassis,so i can paint them white. 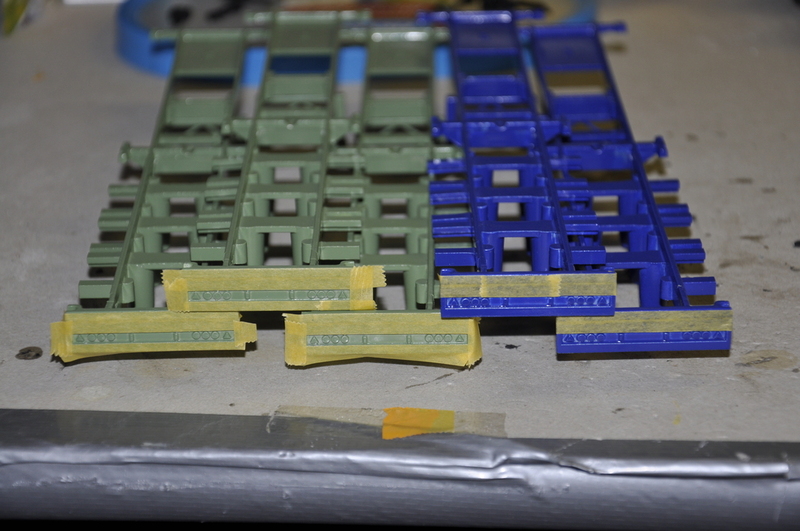 right below ,al the same parts in a row,will be painted bleu and green. 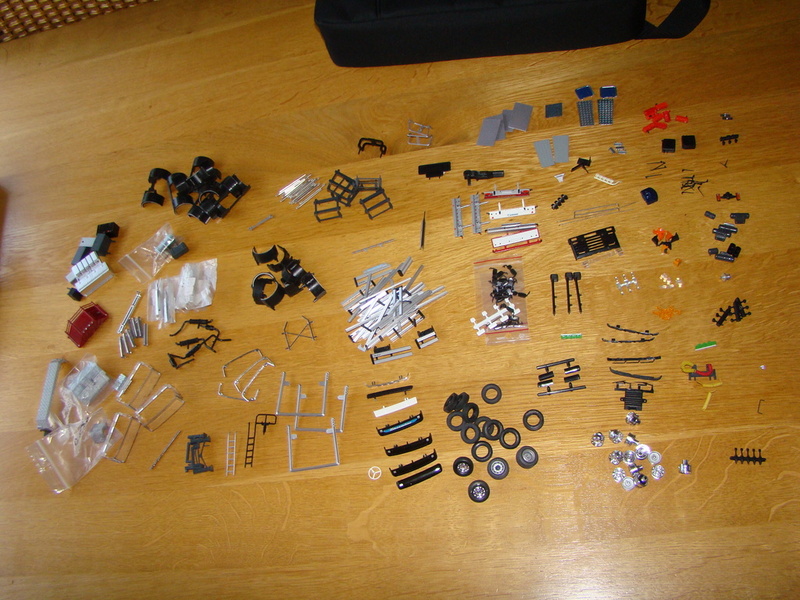 those parts come on the chassis to place the holders for the bike protection.